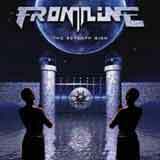 Frontline have been quietly releasing quality melodic hard rock albums out of Germany ever since 1994. I first discovered the band with 2002's release, Against The World. After that release, I began acquiring any Frontline album that I could get my hand on. I quickly realized that Frontline are a model of consistency. Aside from the acoustic album Two Faced, the band have released nothing but rock solid albums that you can play beginning to end without skipping a track. As you can imagine, I was very eager to hear what the band would come up with in 2004 with The Seventh Sign. The opening track You Can't Tame Me shows the band attempting to evolve its sound somewhat. The guitars have a harder edge than in the past, and some modern production techniques are employed. Don't worry, they haven't downtuned their guitars and gone for a modern rock sound. I merely see this "tweak" as an effort to keep from getting stale. They have succeeded on that point, but I can't help but feel that the songs on this album are missing a little something. With past Frontline albums, the album jumped on me instantly. The Seventh Sign just doesn't hit me with this same urgency at first, but that doesn't mean that this isn't still a good album. Songs like You Can't Tame Me and Take Me Higher stand out, but many of the cuts on this album will take a few listens to absorb. Each of the songs on this album are of good quality, but I'm not becoming "addicted" to many of these songs as easily as I have with past albums. I have listened to The Seventh Sign over a dozen times now, and the album is sinking in. I suppose the melodies aren't quite as strong as in the past, but the individual musical performances pick up the "slack" if you will. The core Frontline sound is still present, even with a bit harder edged guitars in many spots as previously mentioned. You still have great guitar solos, intelligent keyboard use, and highly emotional lead vocals. Of course, the big harmony vocals (ala Def Leppard) are still an ingredient to Frontline's sound. Combined with the modest keyboard textures, a slight AOR flavor is added to Frontline's sound. Again, I have to compliment the guitar work on this album. Almost every song contains at least one solo that seems to sing the song without itself. Furthermore, songs like You Never Cried feature some heavier riffs than you might be used to hearing from Frontline. I've always admired the guitar work of Frontline, but the guys may have just outdone themselves with this album. Although you will hear some isolated instances of distorted vocals, the guys haven't strayed much (if any) from their mid-tempo melodic hard rock blueprint of the past. Stephan Kämmerer delivers another stellar performace behind the mic, and the songs once again follow a mid tempo, melodic hard rock blueprint. If you currently own and enjoy any Frontline album, no doubt you'll enjoy this one also. Although, it may take a few extra spins of the disc to fully appreciate. Small side note that I feel worth mentioning… The total running time of this CD is just under forty minutes. By today's standards, I find that to be weak to be blunt. We've all seen EP's clock in at close to that in recent years. I really feel that an additional track or two would have made this album a little bit more fair to the fans. Well, I'd rather have 39 minutes of solid material as opposed to 20 minutes of filler mixed into a longer album. Fans of Frontline know what to expect from the band. The Seventh Sign is an album that you can easily add to your collection with confidence. Just be patient and stay with this album for a few listens if it doesn't jump on you right away. The melodies aren't quite as prolific, but the musicianship is certainly getting better with age. If this is your first listening experience with Frontline, I highly recommend you check out their back catalogue a.s.a.p.